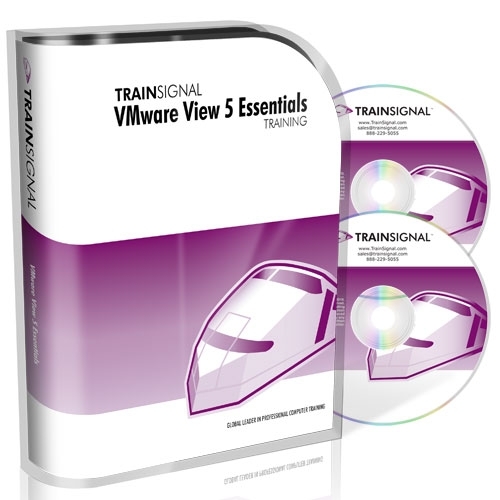 VMware vExperts Brian Knudtson (@BKnudtson) and Lane Leverett (@WolfBrthr) will teach you how to get VMware View 5 up and running in this new video training course from TrainSignal called “VMware View 5 Essentials”. They will teach you everything you need to know to get your environment up and running in just over 7 hours. You’ll learn how to install View components, manage user profiles and data, setup location-based printing, and much more. VMware View 5 Essentials covers new topics to help simplify desktop and applications management while increasing security and control. Some of what’s new includes persona management, upgrading to VMware View 5 and PCoIP optimization with a troubleshooting lesson. Plus, as soon as the VCA-DT5 is available, this course will be the perfect resource! In this lesson, you’ll meet your instructors, and learn about what is VDI and a brief overview of the entire course. Learn about the fictional company we’ll use to place the lessons into real-world situations. This lesson will introduce you to the lab environment where our demonstrations will occur. In this lesson we’ll go over the individual View components and how they fit together to form the overall View Architecture. In this lesson, we’ll go through the steps to bringing your View Infrastructure to life. In this lesson you’ll learn the concepts of building a streamlined base image, pooling of desktops, and how a desktop image can be partitioned into isolated components. This lesson goes through the concepts of getting desktop pools started and maintaining pools and sessions. In this lesson, we’ll discuss and demonstrate how we can maintain the users’ desktop environment from one View session to the next. This provides a consistent and familiar workspace for the users even when they’re not accessing the same desktop every day. Dealing with printers can be difficult in any desktop environment, and View introduces some new challenges. In this lesson, we’ll cover some of the more popular ways of dealing with printers in a View environment. To complete a truly dynamic and efficient Virtual Desktop Infrastructure, you will need to virtualize your business applications. In this lesson, we’ll show you the steps needed to virtualize applications using ThinApp. Once your applications are virtualized with ThinApp, they still need to be delivered to the desktops. We’ll show you several ways to accomplish this in this lesson. After all is said and done you’re going to need to know how to care and feed your new View Environment. In this section we’ll dive into the different views for gathering information about the status of the environment as well as describe and demonstrate some of the different states and status of desktops and sessions. All IT systems eventually fail in some way. To help prepare you for troubleshooting View, we’ve addressed many common failure points and pulled back the covers on several parts of View so you can better understand how they work. For environments that already have View 4.5 installed, this lesson will help guide you through the upgrade process. In this lesson, we’ll wrap up the course by recapping what we’ve covered throughout the course and look at what additional steps you should take in furthering your VMware career. Order VMware View 5 Essentials Today!